I came across this really cool free software for creative writing and more. I haven’t tried it yet, but thought I should post it now in case I forget about it. The software is capable of helping/aiding in writing comic books, graphic novels, screenwriting, and more. Click link to check it out. Celtx is the world’s first all-in-one media pre-production system. It replaces ‘paper & binder’ pre-production with a digital approach that’s more complete, simpler to work with, and easier to share. Multi-Media FriendlyCeltx helps you produce all types of media – film, video, documentary, theatre, machinima, comics, advertising, video games, music video, radio, podcasts, videocasts, and however else you choose to tell your story. All In OneYou can use Celtx for the entire production process – write scripts, storyboard scenes and sequences, sketch setups, develop characters, breakdown & tag elements, schedule productions, and prepare and circulate informative reports for cast and crew. Fully IntegratedCeltx is designed to help your entire production team work together on a single, easy to share project file – eliminating the confusion of multiple project files, and the need for ‘paper and binder’. The Complete Media Pre-Production SystemTogether, Celtx and Celtx Studios give you the most complete media pre-production system available. The free Celtx desktop software delivers the most fluid writing experience. You can always keep your fingers moving as fast as your thoughts and your creative flow is never interrupted. Low-cost Celtx Studios complete your system with an advanced toolset for collaboration, workflow management, and project storage. Non-Linear Project Development Celtx puts a choice of fully integrated development tools right at your fingertips, giving you total flexibility to determine how your story takes shape. World Community of Media CreatorsMore than 500,000 media creators in 160 countries create with Celtx in 28 different languages. Celtx is used by independent filmmakers and studio professionals, and by students in over 1,800 universities and film schools – many that have adopted Celtx for teaching and class work submission. I have added updates to the art resources page. Check out the links for your creative needs. You’ll find links for free software, some of the best software, books, art forums, how to books, entertainment, etc. Click the link below. Create your own cartoons and animations! Anime Studio includes everything aspiring artists and hobbyists need to create quality animations from start to finish. Anime Studio simplifies the animation process, empowering artists to create their projects faster and easier than ever before. 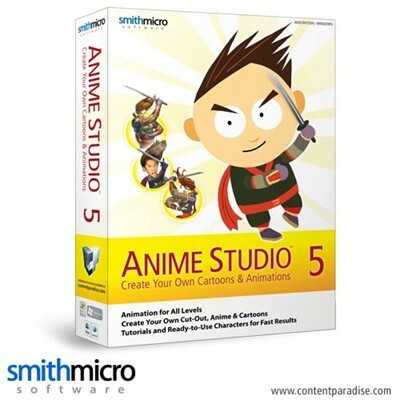 Get started quickly – Anime Studio is packed with ready-to-use anime style characters so you can start creating your own animations right away. Tutorials and sample files show you how to maximize Anime Studio’s powerful features giving you the jump needed from your first project onwards. Your art, your way – To get started, sketch your original art, scan in or import graphics, or if you use a pen tablet you can recreate the sensation of drawing on paper. Vector graphics provide power and flexibility – Use multiple layering and resize your images with no loss in quality. Animate your characters using bones – Using Anime Studio’s bone rigging system, you can add a skeleton to any image by point-and-click to bring it to life. With Anime Studio, there’s no need to create new art for each individual frame as you animate. Just adjust the bones to your desired position and the program will generate the movement for you. It’s that easy! Direct your action with an intuitive timeline – Setting your movements to a timeline makes animation easy to understand. Anime Studio will create animations up to two minutes long. Add audio soundtracks to your animations – Add emotion and style to your animations by adding sound. Anime Studio supports WAV and AIFF formats. Integrate with Adobe Photoshop – Import layered PSD files using a Photoshop plug-in that converts files to Anime Studio format, included free with Anime Studio. You are currently browsing the archives for the Free Software Reviews category.